Day of Military Honor in the Russian Armed Forces are memorable dates dedicated to the country's most outstanding military victories. For example, July 10 is Battle of Poltava Day. It celebrates the victory of Russia over Sweden in 1709. The Battle of Poltava was fought during the Great Northern War near the Ukrainian city of Poltava. Swedish continental army was led by Charles XII of Sweden, Carl Gustaf Rehnskiöld and Adam Ludwig Lewenhaupt. Russian forces were commanded by Peter the Great, Boris Sheremetev and Alexader Menshikov. The battle resulted in decisive Russian victory. Swedish continental army was destroyed, and King Charles XII of Sweden was forced to flee to the Ottoman Empire, where he lived in exile until 1714. Russian victory in the Battle of Poltava marked the beginning of the Swedish Empire's decline as a great power in Northern, Central and Eastern Europe. 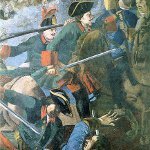 Although the Great Northern war lasted for twelve more years, the shattering defeat of Sweden in the Battle of Poltava is believed to have decided the outcome of the war. Battle of Poltava Day is not a public holiday in Russia, but it is widely celebrated in the military. The day is marked with official ceremonies.